Posted on September 15, 2018 at 10:02 pm. Day one of the 2018 King George Fishing Derby is in the books, one more day to go. We weighed in lots of bass today, both large and smallmouth in both Divisions. 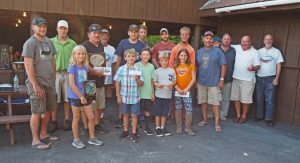 The trolling side was pretty slow, with only one laker weighed in over the 27″ limit in the Adult Division and no salmon over 21″. For the second year after moving from mid-July to September, we had warm weather… and the boat traffic that comes with it. Both made for tougher fishing, along with inconsiderate boaters that can’t seem to stay away from people trying to fish, plenty of water out there to go way around. We had a few issues with the new online Leaderboard but everything has been fixed and all of today’s catches have been posted, so check them out. Good Luck tomorrow everyone, fishing is from 6am to 2pm and weigh stations close at 2:30pm. The Award’s Ceremony will start at 4pm at Lake George American Legion Post 374. Posted on September 10, 2018 at 12:47 pm. The Warren County Conservation Council is also a regular sponsor, again they have donated $180 in gift cards from The Foothills Sportsman in Hudson Falls for Junior prizes. Thanks. Posted on September 10, 2018 at 12:41 pm. Fish307.com has been a generous sponsor every year we have had the King George Derby. For the 4th year in a row they have donated $1000 in gift cards to be used as Junior Division prizes. Thanks again for your support. Posted on September 10, 2018 at 12:36 pm. 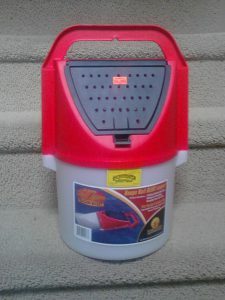 The Outdoorsman Sport Shop in Diamond Point has donated a bait bucket for the door prize raffle. Posted on September 10, 2018 at 12:33 pm. 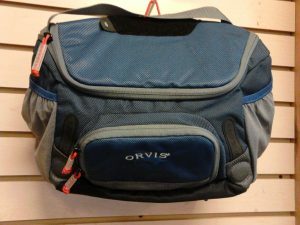 The Orvis Store in Lake George has donated this nice fishing pack that we will award as a door prize, valued at $100. Posted on September 10, 2018 at 12:27 pm. The Derby is almost here and we have been busy getting ready, especially with the new online registration and leaderboard. If you are registered, be sure to check in on Friday, September 14 from 4-8pm at the Lake George American Legion Hall. You will pick up Derby packets, T-shirts if you registered early… plus get some food and a beverage on us. We will also have T-shirts available for purchase. Posted on June 25, 2018 at 10:02 am. We will be using a new tournament management program this year that will allow us to add a real-time online leaderboard. That means entrants will be able to check the current standings for all divisions and categories from their phones, if a fish isn’t big enough to place they can keep fishing and hopefully release a fish that won’t be eligible for a prize. The management program also will take care of online registrations and we will enter all others including the last ones at Check-in on Friday September 14 from 4-8pm. With all entrants in the system, the weigh in process should go more smoothly and speed things up. Results will be automatically tabulated and updated, lessening the chance for errors and will make things easier for the volunteers involved. Posted on June 25, 2018 at 9:47 am. The King George Fishing Derby committee has decided to lower the minimum size for landlocked salmon from 22″ to 20″ for the 2018 event. Since most people keep legal salmon to eat, and they are a stocked fish, a lower limit should not have an effect on the population. Last year no salmon were entered despite some nice ones that were out there, the warm weather we experienced after a couple weeks that were colder than normal didn’t help. Posted on September 17, 2017 at 7:08 pm. The final results have been tabulated and we just had a great Award’s Ceremony at the LG American Legion, gave out lots of prizes to the winners and lucky door prize winners.